Gubeikou is one of the most well-known strategic pass and most accessible sections of the Wall in Beijing. This is an awesome place where you’ll experience uncrowded adventurous hike and the power of nature. Divided into four parts: Wohushan, Panlongshan, Jinshanling, and Simatai, The famous Gubeikou Great Wall stretches for more than 40 kilometers (25 miles). The solid watchtowers at Gubeikou have six archways, ten arched doors and two floors. The highest point of Gubeikou is Wangjing Tower, 986m (3235ft) above sea level. Gubeikou is not merely a relic but it remained as a battlefield in 1930s. Chinese army fought against Japanese invasion troops at Gubeikou in 1933. 360 Chinese soldiers died and were buried at the foot of Gubeikou cemetery. No rebuilding or renovation was done since anti-Japanese invasion war. Gubeikou is remote but more easily accessible, only the initial climb up is physically demanding. Walking on Gubeikou Great Wall towards Jinshanling is really a great moment. All of a sudden you can see the Wall on the mountain tops stretching as far as you can see, like a never-ending dragon. 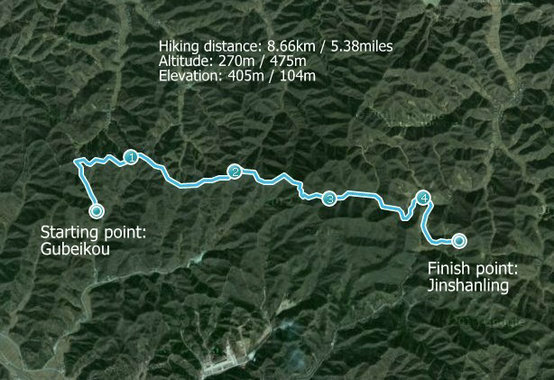 Start / Finish: Gubeikou – Jinshanling. Public transport is Not directly available to both ends from Beijing. A quicker, easier option is to hire a taxi or arrange private vehicle transport from Beijing. Generally takes about 2.5 hours to reach Gubeikou. Season: All year. Spring and fall offer fine weather. Winter can also bring clear skies, however, frozen snow and ice can make the walk more difficult. Summer can be hot and hazy. Maps / Info: Map is necessary, but more practical way is to hire a guide. The hilly trail is hard to follow as part of Gubeikou is officially closed. Make a detour in the middle of the hike where the military area begins. It’s not easy to find the right way up, as there are no signs for the detour. Better to hire a guide to walk with you. Admission fee: needs to be paid at either Gubeikou or Jinshanling. Part of Gububeikou goes through the military area. Very often, there is only room enough for one person to pass at a time, with nothing to hold on to for safety. you need to look out for loose stones underfoot, as they may easily cause you to lose your footing. Watch out for the sharp spines of the nearby plants, which may hurt you or snag your clothes in spring and summer. Several watchtowers have collapsed, with few complete bricks still in place. Grasses grow in abundance through the cracks between bricks. You may see the names of previous visitors carved into the bricks. The ancient royal road, the Yang Linggong memorial temple, and a medicinal king and bodhisattva temple are nearby. The ancient royal road was built during the Emperor Kangxi for going hunting. Yang Linggong temple was built in honor of a Song Dynasty general named Yang Linggong and his family.